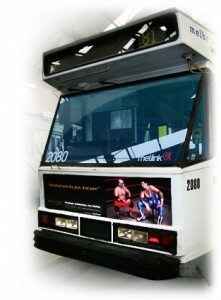 Vinyl cut lettering is designed in Australia on a computer and transmitted to a plotter printer. During the printing process the letters are scored (cut) to the exact shape chosen. Using modern printing techniques and equipment it is possible to achieve the most amazing effects. There are many types and colours of vinyl to choose from with varying thicknesses and qualities. We can access a large range of fonts which are available via modern professional graphics packages. The spectrum of colours available with vinyl cut lettering and graphics is vast and almost any feature can be achieved. Vinyl cut lettering can be cut from fluorescent, metallic, reflective and a vast range of Vinyl finishes and textures. We will be able to help you with text and artwork if you require assistance. We use only the finest substrates (stock) to print on with excellent quality inks and fully understand our customer’s expectations. Our technicians are available to install the vinyl lettering at your convenience; installing cut vinyl is a specialised job and should be carried out by a proficient technician. The surface to be adhered to has to be smooth, clean and dry. Barney’s offers a full guarantee with all work supplied to our customers, this gives you total peace of mind. If you are looking for creating a building and outdoor signage for your business or organization, then you are definitely in luck! We at Barneys also specialise in affordable corporate outdoor signage. Go ahead and check out our corporate Building and Outdoor Signage. Should you be looking for more of our customisable products, check out our sister website Fast Caps personalised Organic Cotton Cap. It is a simple yet exquisite gift item that comes in white, black and navy blue. This premium corporate gift item is a perfect material that can also hold your own customised artwork and graphic design. We can hardly wait to be a part of your next project! Give us a ring at 1300 663 812 or opt to just simply have a tête-à-tête with us by writing to us on Live Chat below.